The industry saw its largest annual dollar gain ever in 2015, adding $4.2 billion in sales, up from the $3.9 billion in new sales recorded in 2014. Of the $43.3 billion in total organic sales, $39.7 billion were organic food sales, up 11 percent from the previous year, and non-food organic products accounted for $3.6 billion, up 13 percent. 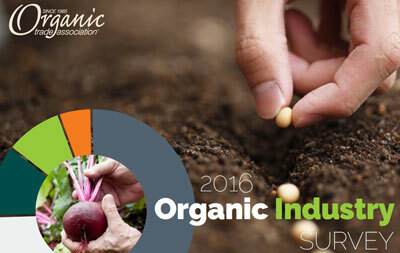 Nearly 5 percent of all the food sold in the U.S. in 2015 was organic. Organic Fruits & Vegetables retained its longstanding spot as the largest of all the major organic categories with sales of $14.4 billion, up 10.5 percent." . Produce has always been and continues to be a gateway to organic. It’s easy for shoppers to make the connection between agricultural practices used in the field and the fresh fruit or vegetables they bite into. Almost 13 percent of the produce sold in this country is now organic. That said, Americans still like to snack, and more and more of us are snacking organically. 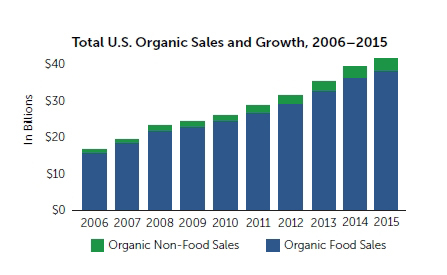 Also seeing a big growth in sales in 2015 – and more than triple the level of just 10 years ago -- was the organic snack food category, with sales of $2.3 billion, up almost 14 percent from 2014. Consumers are not just eating organic, they are incorporating more into their total lifestyle. Organic non-food products continue to gain in popularity. Even though non-food products account for just 8.2% of overall organic sales, the almost 13 percent growth rate in the sales of organic non-food products outpaces the growth rate in organic food, as well as the overall growth of comparable products, primarily conventional, which inched up by a mere 2.8%. Growth in the non-food category was led by organic fiber, followed closely by organic supplements. Executive summaries of the survey are available to the media upon request. The full report will be available for purchase in June. Preorders can be placed on this page.